I've been elected this year, by one of my nieces, to hunt for a perfect costume for her. Maybe she feels her crazy aunt would have better ideas than her mom? At any rate, I've been looking for spooky and cute costumes for my niece. I keep thinking of things that I would have wanted to wear at her age! There are so many cool ideas out there, but I really like these undead ballerina costumes on Amazon. I'm pretty sure my niece would love this "skelee" ballerina costume. First of all, the spandex material will keep you warm for trick or treating. The tattered tutu definitely enhances how undead she looks! 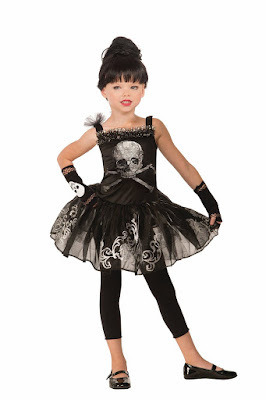 This is another really cute skeleton ballerina costume. It's not very spooky, especially with all the hearts on the tights! If you have a little one that's more into girly stuff, this is a great option. Speaking of princesses, this gothic ballerina costume is fit for a queen. I definitely like the more macabre style for this ballerina. I wish this came in adult sizes, but I'm sure that would be embarrassing for my niece! This skull ballerina costume is pretty awesome. I think you could even get away with wearing this at a metal show. That would be a fun trip. I love the Victorian shapes and spirals decorating the tutu! I'm not entirely sold on the undead ballerina costumes on Amazon. It's an option, but there are still so many costumes out there I haven't looked at. What do you think of these ballerina costumes for Halloween? Tell me about it down below!